Kitty spoke of a trip she took to New Guinea where she met other youth her age who lived in impoverished villages. Yet, while they lived in conditions she could not imagine, everyone seemed to be happy because they helped each other out and placed serving each other above their self-interests. They taught her the joy that comes from serving others to overcome normally unbearable conditions. This was an experience which has become part of her and changed her outlook on life. Picking a winner from the four students who represented Irvington and Kennedy High Schools is never easy. Each of the contestants presented moving speeches which conveyed a depth of thought and reflected a bright hope for their generation. They were all winners from our member’s perspective. 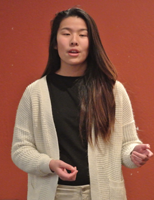 Kitty will now move on to the Area level contest where she will compete in March with the winners of the four other Rotary Clubs in south Alameda County.